The play is defined as any kind of freely chosen activity, intrinsically motivated, and personally directed. It is vital for physical and motor development, but also social, emotional and intellectual development. Play in NICU might be challenging due to baby`s clinical state, which might not be suitable for doing some activities; due to distracting noises, the equipment connected to the baby, the regular procedures that the baby is undergoing or lack of space for keeping the toys. In our case, the play was an issue because Aurora and Victoria had chronic lung disease and they used most of their energy on breathing. However, we tried to stimulate them in a way that wasn’t too demanding and stressful for them. Apart from talking and singing to them whenever it was possible, we made sure they also had the toys that were suitable for their age and also, recommended by the play therapist and occupational therapist — for example, sensory lights or musical instruments. We even used an application on the telephone for visual stimulation. Aurora playing with the sensory lights provided by the hospital. Our play sessions in Nicu represented a great time to bond with the girls, to see their psychological progress and to share smiles, which we enjoyed a lot. If the girls were awake at the same time and in a good mood, we use to put them together on a play mat and observe them, making sure the water from the tubing that belonged to the breathing machine, was not going into their nose. Sometimes, we use to put them next to each other in their bouncing chairs and entertain them by playing peek-a-boo, reading a story or show them different toys. We used to facilitate play by putting the girls in a comfortable position, for example making rolls for their head, so they felt their head safe, which also helped with the correction of their head shape. As you know, babies are at risk of plagiocephaly, because of their relatively soft skull. When on the play mat, we use to roll a towel and put it around them to encourage movement, bringing hands together or touching their feet. In term and healthy baby, these things happen naturally, and the parent notices his baby already rolling over and putting his feet in the mouth. A premature infant instead, needs help with the smallest things to build up his mobility, strength and confidence, and play represents the best way to achieve these things. Once Maria was allowed to visit her sisters, she used to bring her toys so they could play with them and to pretend to be a doctor and treating them. It was fascinating to see how play connects the children and helps them communicate. When she was around, Aurora and Victoria kept watching her and smile, showing they loved her presence. It is important to know that a premature or sick baby has his rhythm to play and parents should respect that and follow it, to make sure the baby is not overstimulated and distressed. 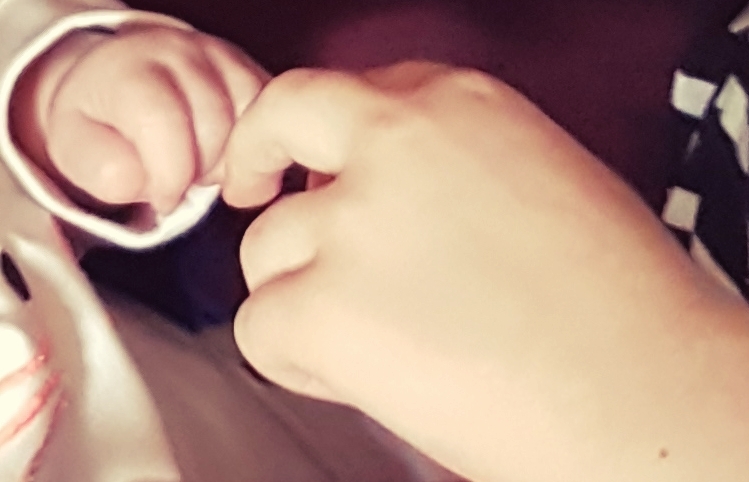 Whenever the baby looks overtired, or I pain, he should receive the opportunity to rest and recover, until he shows he is ready to play again. Aurora and Victoria as well, had days when they just wanted to sleep, to be held, and not being interested in any toy or activity and we just listened to them. Aurora had a period when she was continuously fed via an NJ tube because she got stuck from the breading point of view and doctors considered it would help her lungs if her tummy was empty and the possibility of vomits was reduced, which prevented the aspirations to her lung. The insertion of the NJ tube required a lot of attention, ability, and an X-ray to make sure it is in the right place. During that period, we have been extremely cautious with the way we moved or let Aurora play because nobody wanted her NJ tube to come out, and restricted at the same time by the feeding pump that was pushing the milk. In conclusion, play in NICU is crucial, although sometimes it is so difficult to achieve. I found it upsetting and stressful to take care of so many tubes and wires; to make sure I do not pull something or harm the girls. I dreamt to the day when I could run in the park with them, let them roll over and lift them to the sky, without any restraint, without any impediment. I desperately wished that freedom, and when it came, it was such a relief.